MarionH - BTW, that wool in those batts looks D-E-V-I-N-E! Love it! please do tell a bit(lot) more about your carding methods- how do you mean layering? I have been expermenting but just get striped .I have an ashford drum carder that hasn't been getting much use because I'm not happy with the results I just feel dumb because I don't get it!!!! I have tons- well pounds of raw wool just sitting !!!! I also have the normal sari silk, but havent tried to card it yet. Here's some cormo, bamboo, angelina blend I created awhile back. First I card the cormo and bamboo separately then I blend by layering and adding the angelina in between the layers. I was wondering, how do you get them into that ball shape ? I always make batts, never figured out how to ball them up. I take the bats and twist the ends in opposite directions twice which causes the bat to twist on itself like a skien of yarn would. Then I grab the ends and pull them halfway through to create the ball. I'll try to draft something up to scan in to make it clearer if you need. I take the bats and twist the ends in opposite directions twice which causes the bat to tist on itself like a skiend of yarn would. Then I grab the ends and pull them halfway through to create the ball. I'll try to draft something up to scan in to make it clearer if you need. 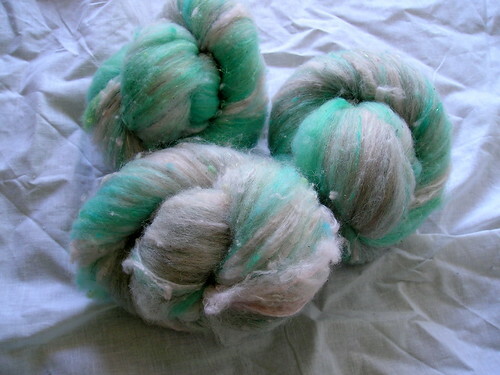 *sigh* in my dream world a spinner would live really nearby and would go halves with me on a drum carder... I should probably first get some hand carders and start somewhere, lol. Fiberwish- Wow! Congratulations on your big win and new drum carder. I love everyones batts! I never remember to take pictures because after I card some I sit down and start spinning them. I just take a small amount each of at least 3 colors, card them each separately until they are well carded, then I put them on the carder by adding one after another. At this point you will have a "sandwichy" looking batt, it should look layered from the edges, but solid colored on the big flat sides. Then I split it into 4 strips and card them together, then I repeat until I am happy with the batt. Easy and fun, and the results can realllllly change the way you look at color. Optical mixing starts happening after it gets carded 3-4 times, and it can get a little muddy, too. I put my layered batt through 3 times to get a nice blend without losing the original colors. Sometimes twice is plenty, you really have to eyeball it. So fun...you'll be addicted!